NOTE: As always? SPOILERS SPOILERS SPOILERS on everything in the game, its story, conclusion, revelations, and identities. Seriously. SO many spoilers. You can't even imagine. Read at your own risk. 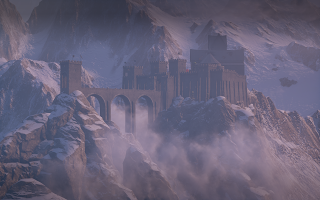 place where the Inquisition can build, grow... Skyhold. The sequence in Dragon Age: Inquisition that takes place from "In Your Heart Shall Burn" through "The Dawn Will Come" and then, finally, through the discovery of Skyhold, represents an extraordinary series of unforgettable and powerful moments that propel the game and its storyline into a bold new reality. And if Dragon Age: Inquisition is an interactive novel at its heart (and I truly think it is) then this is where the novel's first section ends, and the next begins. After the word "Skyhold," everything changes, yet again. But let's not get ahead of ourselves. In the meantime, the conversation with Solas in the darkness in the previous scene, after "The Dawn Will Come" and under the ghostly glow of the blue mage torchlight, fades away into a pale, pink and brilliant new dawn in the mountains (a lovely, subtle callback to the hymn of the previous scene), as the strings of Trevor Morris's beautiful score surge up in a theme of epic hope and discovery. The Inquisitor starts this day by literally looking to the sky (as the hymn demanded), and yes, the dawn is here. And Solas is just getting started. His moving and eloquent voiceover (another high point for voice actor Gareth David-Lloyd), as he urges the Inquisitor forward and onward to lead their people to safety, is one of the most striking and emotional events in the game. It also lives up to the whammy of the previous two sequences in a new yet very big way. And it's important on a story level, given what we discover later, that it is Solas telling us these things, that it is Solas orchestrating events. 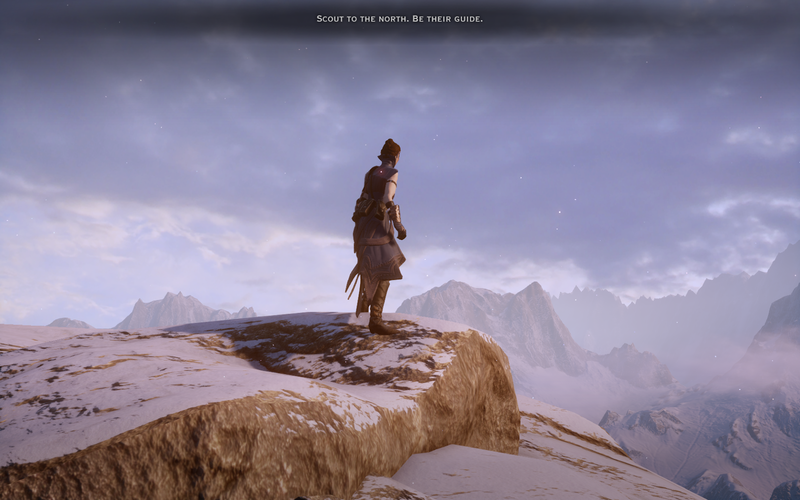 That it is Solas saying, "Oh, wow, a castle yonder, just empty and waiting! Talk about timing. Good thing I managed to wander over to it in my dreams last night!" Cough. The quiet elven mage, indeed. Giselle, who's obviously kept up with her cardio. As Solas speaks, we see our followers walking slowly and thoughtfully through the snow, watching the Inquisitor, yet now serene and trusting to their faith. They are making steady progress, although honestly, I'd be hyperventilating, crawling dejectedly and asking to die—look at the slope of that mountain path. It's just not right. 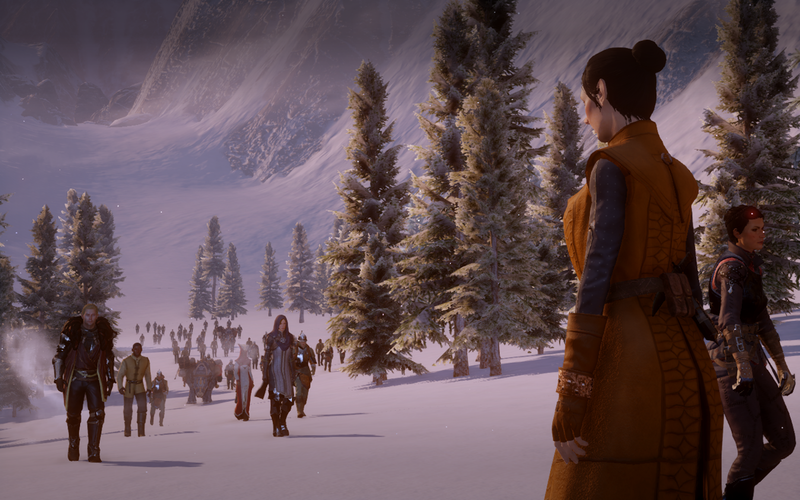 Cassandra leads the pack, just steps behind the Inquisitor and Solas, then comes Cullen, trudging solidly and thoughtfully off to the side (although if this moment were truly portrayed accurately, there would also be a pretty long line of men and women walking behind Cullen, checking out that view). Then comes Leliana, lovely and calmly regal in her warrior-nun armor. Not far behind Leliana, next, is Mother Giselle, whose previous stint in the Hinterlands obviously included some cardio, because she's doing a bang-up job of hiking in the mountains despite wearing the equivalent of a confining cylindrical tent from head to toe. I wish we could've seen Bull here, carrying a tired villager on each shoulder (or perhaps Sera! ), or Dorian, distastefully picking his way through the snowdrifts and lamenting their effects on his outfit. But our focus is on our advisers and the survivors, as we then glimpse the rest of the villagers, the hundreds who survived Haven, as far as we can see... and all is quiet, orderly, and bright. The people walk calmly, supporting one another and shepherding their pack animals along. Somehow, everyone can feel that things are going our way once more. Then at Solas's urging, the Inquisitor is running tirelessly forward, watching and analyzing the terrain and the majestic peaks around them. We're making progress, and Solas's stirring voice urges us irrepressibly forward. 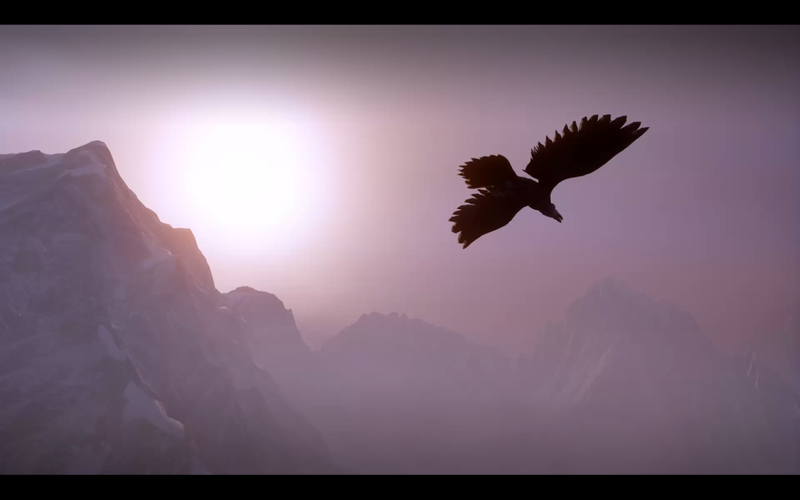 Then the score changes again, as a gorgeous solo female voice lifts above the music as a delicate harbinger of hope, as a single hawk flies high in the misty early sunlight. Then a warm, low surge of strings (very Coplandesque) signals the next change, as the people of the Inquisition walk together across the bare ground (an ancient path through its all-important, hidden mountain pass). We're close. We're almost home. Solas: There is a place that waits for a force to hold it. There is a place where the Inquisition can build, grow... Skyhold. As Solas speaks, the confluence of words, voice, triumphant music and soaring imagery all combine to create a moment that is downright cinematic. It's easily one of Trevor Morris's most notable and lovely moments, among many in his beautiful and sweeping score for the game. For me, it's my favorite musical sequence in the entire game, barring the final devastating minutes of "Trespasser." Meanwhile, I absolutely love the way this sequence ends, with the gorgeous sweeping view of the beautiful waiting castle, then the moment as the Inquisitor leaps forward right past Solas in their eagerness, as he pronounces the single, resonant name of this new home: "Skyhold." Followed by his rather pleased, secretly satisfied expression as he watches them. What do my elven eyes see? Is that Mount Doom, far ahead? And that expression... it's almost smug. Solas might as well be skywriting I DID THIS. Just another reason why replaying this game is even more fun than the original playthrough. So many secrets and revelations! It truly is a pretty subtle, amusing moment that you can only truly appreciate on replay. Solas is in full control here. He's not surprised, he's cool, privately amused, and perhaps charmed at the Inquisitor's eagerness. And I think he's also going, "Well that went well." He may also, if on a romance path with the Inquisitor, be thinking about how everything comes full circle, since he just gave the woman he loves a powerful and ancient stronghold. And not just any castle. His castle. The place where it all went so terribly wrong. And where he now hopes to try again. If you've played through DAI at least once before, this scene has layers upon layers. 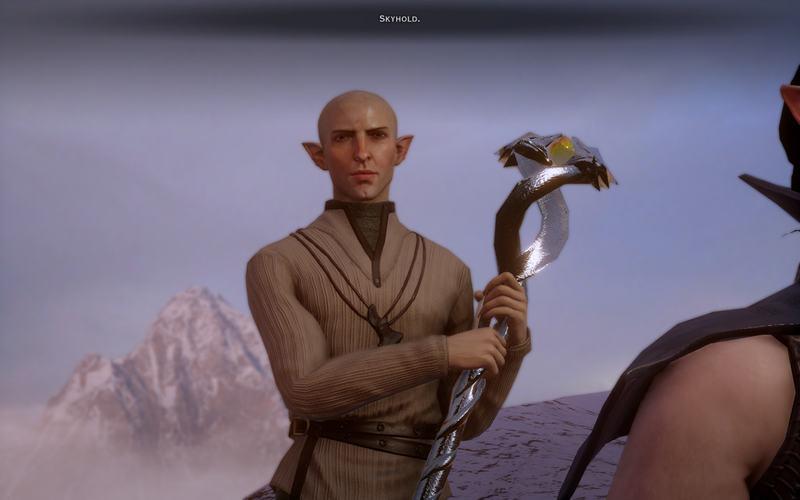 Because Solas isn't just helping the Inquisitor find a conveniently abandoned castle in the mountains. Again, he's leading her his very own ancient stronghold. There are numerous reasons to find this both lovely and also oddly tragic. It's a terrific bit of symmetry. It's also quite wonderful metaphorically, if you believe, as I do, that this is another way in which Solas is seeking potential atonement. Or self-recrimination? Both are possible. Since his awakening, we know from The Masked Empire and DAI (and Trespasser) that Solas has been weak, terrified, grieving, and enraged, wandering and homeless for the past year or two since his physical awakening. That's why this moment affects me so much. Solas spent that time alone, homeless, sleeping under the stars or nestled in ruins, on hard stone beds and rejected by his own people. Then what does he give us? His very own ancient fortress, presented like a jewel in the heights, as if he's saying, "Here. Take it. Use it well." Well, maybe. Hopefully. But I'll get to alternate meanings in a moment. It's a spectacular contribution to the puzzle that is Solas. Yes, he is seeking to accomplish decidedly bad things in many ways. But he's also one of those people who—even in dueling you to the death—would pause to let you pick up your sword if you dropped it. That's Solas. And there's a vulnerability to it, one I'm not sure he's even entirely aware of (although he does speak to a romanced or high-favor Inquisitor of his inclination to trust and say too much, in "Trespasser" later). This behavior—giving away the advantage to even the field—it's not Bull, and it's not Leliana. And I say that without judgment. Bull and Leliana are simply more ruthless, more jaded, and more absolutely willing to be more brutal when necessary because that's just part of waging war. For them, a win is a win. But, despite all the rumors and myths of his duplicity and tricksy tendencies... despite his confusion and despair at what he created... it is Solas. He will pause, extend the sword, then and only then resuming the fight. There is some kind of intrinsic and unbreakable honor there. All time is transformed into the final/first death (uncertain). Even brokenly translated, there are exciting implications here. An apology and a promise? Sounds about right, given the situation. Side Note: I read this part, and yeah, I was facepalming all over the place, going, Oh, Solas. In the words of the immortal Leslie Knope, Solas, you beautiful, rainbow infused space unicorn... This is one of those rare moments where you're not deflecting or deceiving through omission or implication. You're just lying. Lying lying lying. WHY DO I STILL LOVE YOU. Please excuse a slight pause here, for hugs, chocolate, an infusion of coffee (oh, all right, it's wine), and Dalish mantras. As to the former, I myself cannot say for certain. The whispers of old memories carry a thousand such names upon their breath, and it is possible that this name belonged to some other keep in some other land. Still, it seems an auspicious name, for there is one peculiarity of language that your scholars seem to have missed. When the words reached my dreaming mind, Skyhold was not simply a fortress near the sky, nor was it some simplistic allusion to holding up the sky. Skyhold—Tarasyl'an te'las— was "the place where the sky was held back." Given your efforts against the Breach and our battle against a madman who seeks to assault the Black City in the Fade, I can only hope that the Inquisition’s new stronghold lives up to its name. Again, I love all of this from a dramatic standpoint (and always think Bull would find it both fascinating and amusing as well, as our superlative lifelong spy). Why? Simply because how someone chooses to lie to us can sometimes be just as revealing as the truth they're actively trying to hide. What does Solas reveal? What does he partially reveal? What does he omit outright? You shouldn't have. I love it. Thanks, honey! Well, a lot. He's subtly letting us know that, first off, Skyhold is certainly older than we perhaps assumed at first glance, and it appears to have metamorphosed or evolved over the years, to some extent. He doesn't address its possible ancient elven status (reinforced by other discoveries around the keep, such as the ancient elven arrow on one rooftop) nor what may have shaken its very foundations millennia back (the imprisonment of the Evanuris and formation of the Veil?). And I'm fascinated by how bothered Solas seems to be by the idea that we may have mistranslated or misconstrued the meaning of "Skyhold." He seems genuinely irritated and worried that we may assume some simplistic human translation for the name. He wants us to know that the name isn't about our fortress being near or metaphorically holding up the sky. He seems intent that we understand that, instead, it was a place that physically held back that sky. That it is a place of magic. Force. Power. Barriers. Delicate manipulations from the Fade. 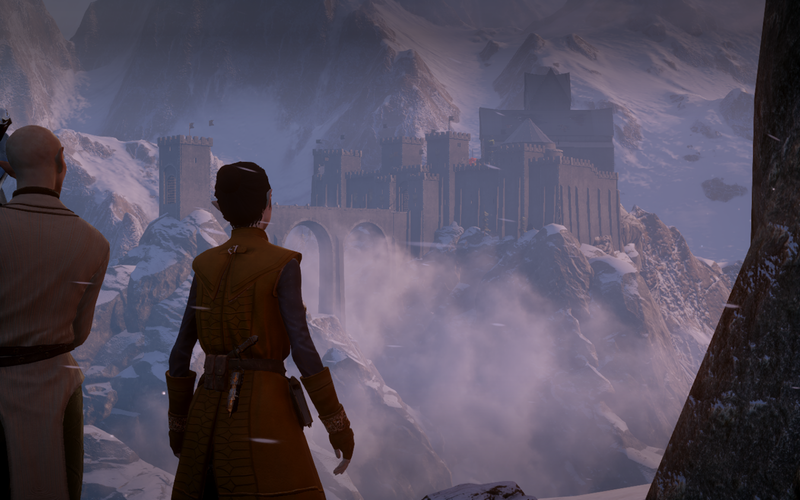 I can't help but also think that Solas is trying, perhaps, to tell us that Skyhold itself is magic (something Morrigan later basically implies from her research as well, while noting that even the walls of Skyhold are absolutely steeped with protective magic). That it carries special powers that will keep it pure and safe from harm. I even wonder if Solas isn't actively attempting to buffer or support that magic, on the sly. It's definitely possible. Or is there something self-serving about it, and is Solas using his return to this perhaps vital and magical location, to help himself recover and recharge his power? Those frescoes could be more than mere paint and plaster. Meanwhile, all of this conjecture by Solas about Skyhold is great and helpful and fascinating despite the fact that darling Solas is once again, of course, lie-lie-lying his bald little head off. Skyhold is his place, a place he knows down to its bones. He once stood where we stand, breathing the crisp keen mountain air, tasting the snow on his tongue. While the structure may have changed, he once viewed these very peaks as their lord and master (and it may comfort him that this, at least, has changed little in the millennia in which he lay dreaming and in despair). I think it's very telling that, as Solas begins to truly awaken to this new world, and all of its horror as well as its hidden beauty; as he begins to tentatively reach once more for companionship and even for love or desire, I think it's vital and elegantly plotted that it all begins with this moment—when he comes home. As an elf noble of the ancient days, Skyhold wasn't Solas's first home, certainly, but it appears to have been one of the important ones, and in a vital and hidden way that we can't yet wholly define. Homecomings are popular scenarios in books and films for a reason. They bring out characters' vulnerabilities, strip them down, and show us who they really are—as well as who they were. Where we come from, after all, frequently shapes who we become. As we discover Skyhold, Solas's plans are functioning well. But he's now more vulnerable, open, emotional and undefended, than he's been for a thousand years. In the DAI Trespasser DLC, the Archivist in the Sundered Hall of the Shattered Library shares with us the following crucial fragment of memory: "After he held back the sky to imprison the gods, the Dread Wolf disappeared." Which is pretty interesting for a number of reasons. 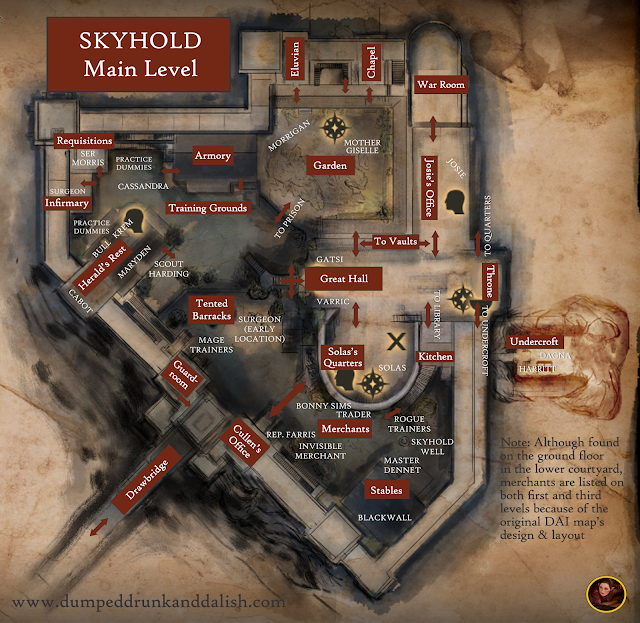 It means, for one thing, Skyhold got its name from the very act that doomed the elves—and confirms that it was also the place where Solas created the Veil and caused a titanic cataclysm (as evidenced, as mentioned earlier, by the vestiges of some massive explosion in Skyhold's lower/prison areas). The result was that Solas then found himself sleeping and adrift in the Fade for over a millennium. It's a pretty big reveal, if you think about it. It makes me wonder even more what Solas is thinking when he sees it again. Is there sadness, or at least ambivalence? Is this why he spent the year following his awakening trudging through Thedas and getting turned away by the Dalish—instead of facing the place where it all went wrong? If the attack on Haven had never happened, would he still have led us there? Instead, he immediately begins to create his breathtaking and beautiful murals, panel by panel, across the walls of his rotunda in order to commemorate the Inquisitor's story. Each major story point is a subtle new gift from Solas (even to an Inquisitor he dislikes or disapproves of) in a priceless and gorgeous series of frescoes in the style of the ancient elves. It's as if he's putting the bow on the gift of his castle, saying, "This was your story." The room was never truly his—he was readying it for us. I also can't help but wonder if there's magic in that plaster and pigment—one more attempt to protect this place and its people. Alternatively, there may be a darker meaning there, as well. The frescoes may in fact very well be Solas's actual obituary or tribute to the Inquisitor, a kind of epitaph—a final tribute to the person (and companions) regrettably sacrificed when and if his plans are accomplished. It would be a believable step for a foe who, if nothing else, seems prepared to bear the guilt and responsibility fully of whatever catastrophes his decision to tear down the Veil will bring. And after all, it would be very like Solas to return to Skyhold upon the upheaval of the world... and to steadfastly stare at those panels each and every day as penance. My next question is whether he plans to return. Does he see Skyhold's occupation by the Inquisition as a temporary interval until he reclaims it once more? And if so, does that mean he's simply doing a little home improvement—literally prepping his return by decorating the walls of his past and future home with a few snapshots of things he cannot bear to forget when the world's present state no longer exists? Let's face it—if it's "steeped in magic" as Morrigan suggested, Skyhold would be a good place from which to—once again—attempt to stage his plans in tearing down the Veil. It survived the attempt once before, after all. eyebrows. They are so eloquent, like facial parentheses. The final and most definitive evidence that Skyhold was Solas's is spoken to us by Solas himself, in a fascinating dialogue moment from Trespasser that is only witnessed by Inquisitors with low approval from Solas. If, in discussing the finding of Skyhold, the Inquisitor responds sarcastically (the dialogue choice, "Thanks, I guess? "), Solas will reply simply with, "Enjoy it while you can, Inquisitor. It was mine once." It's the final confirmation that yes, undeniably, Skyhold once belonged to Solas. And I loved this actual confirmation and all the mental images it conjured for me. Oh, the headcanons possible from this final revelation! Did he sit on a throne? Which room was his, way back when? (The Inquisitor's? Surely not the rotunda?) How long did he live there? What intermediate campaigns or struggles against the Evanuris did he helm from those immaculate peaks in the Frostback Mountains? His reasons for passing along his own former battlements were undoubtedly complex, along with his feelings. After all, Solas may have disliked or feared our Inquisitor, admired or even loved us. And even if he did love us... he left. But he gave us a castle first, ensuring that the Inquisition (and the Inquisitor most of all) would have the home that he would seemingly eternally continue to deny himself. A fitting setting for what his pride had wrought. As a Solasmancer, there are a lot of very interesting (if emotional) subtexts to the discovery of Skyhold. It really knocked me out to realize it. And thanks so much for reading! Sorry about the feels (but it's the best compliment ever). Blame Solas!